What a wonderful life. Pete Seeger was a man for the ages. He was not just a singer, songwriter, activist and environmentalist, but also a national treasure and one of the most important figures in American culture. When Pete passed away back on January 27 at the age of 94, we all reflected back on the life of this great man. He lived a life of purpose, determined to improve the world we live in even if it meant alienating some people along the way. He was strong and fearless, driven to make this world a better and fairer place. He truly lived every single day of his nearly 95 years to its absolute fullest. One of the many issues important to Pete was the well being of the Hudson River. The river was in dire straits after many years of abuse with rampant pollution, resulting in the disappearance of river life. Pete decided that something needed to be done to change the Hudson’s fortunes. In 1966, Pete first announced his plans to build a boat that would raise awareness of the sad state of the river and devise ways to clean it up. With that, the organization called the Hudson River Sloop Clearwater was founded. By 1969, the sloop “Clearwater” set sail on its maiden voyage and since then, the sloop regularly sails the Hudson conducting educational workshops and serving as a floating laboratory. The yearly festival, Clearwater’s Great Hudson River Revival, grew from early riverside concerts conducted to the raise the money needed to build the sloop. As the years passed, the Clearwater Festival grew larger and larger, becoming a two-day celebration focusing on the conservation of our planet as a whole. This year’s festival will be bittersweet, as it will be the first one without Pete’s presence. 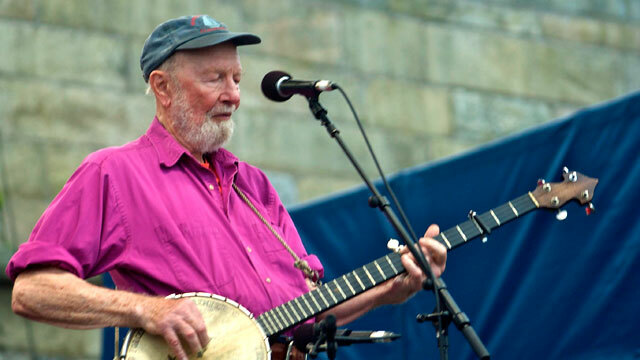 That said, it will also provide an opportunity to celebrate the life of Pete Seeger and also his beloved wife, Toshi, who died only six months before Pete on July 9, 2013, at the age of 91. For more about the Clearwater Hudson River Revival, visit clearwaterfestival.org.